This is my 2nd time reviewing for beautybox5. I love being about to try a product without having to spend tons and tons of money. This month's box was great, I love when I get a box and truly use all the products! Awesome products, good sizes and a great value! You can't go wrong purchasing this box for yourself or giving it as a gift. The Products: 4-5 full size and sample size beauty products. Each box comes with a card detailing the items included for that month. The March 2014 Beauty Box 5 theme is “Out with the old, in with the new!” The focus is on throwing out the makeup we never use, stopping bad habits and zoning in on our top beauty goal – clean, gorgeous skin. Tree Hut Shea Body Butter in Coconut Lime – 2 oz Value $2.50-HEAVENLY! It smells so delicious and works so well. It left my skin wonderful-GREAT PRODUCT. Jane’s Pick All Natural Soap – Guest Size Value $2-A very pretty bar with a very light scent. Bellapierre Cosmetics Makeup Base - .25 oz Value $18-My daughter loves this-it matches her skin perfectly. It is very smooth and creamy and stayed true all day. Swissco Dual-Sided Facial Pad – Value $2-This is a great product for exfoliating- A must have since summer is on it's way. H20 Plus Hand & Nail Cream - 1 oz Value $2.50-Very lightly scented. Non-greasy and quick absorbing, plus a little goes a long way. This was my favorite of all things in my box this month. 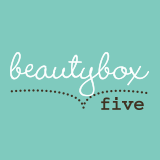 Beauty Box 5 is a subscription-based, beauty sampling program that delivers a box filled with 5 cosmetic samples to your door every month. Aimed at introducing women to new cosmetic products and educating them on best practices, Beauty Box 5 scours the market to find the best products for your lifestyle. WHAT KIND OF PRODUCTS CAN I EXPECT IN MY BOX? And just about anything else beauty related!